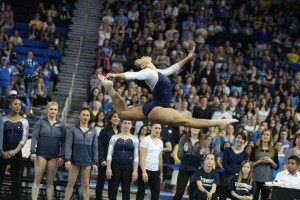 UCLA senior Sophina DeJesus introduced gymnastics to the Internet and virality to the Gymternet earlier this season. Shortly after being posted, a Facebook video of her floor routine exploded to levels of fame much higher than those seen by other viral gymnasts like McKayla Maroney and Lloiminicia Hall. The fan-posted video has reached nearly 29 million views—by far the most of any online gymnastics video—a number typically associated with videos of pop stars and Charlie-bitten fingers. And that’s just on Facebook—other versions posted elsewhere have also garnered millions of views. Primarily, this routine presented an untraditional display of gymnastics that shattered the classic role of “the gymnast” in the public eye. Sophina Whips, Nae Naes and Dabs—easily recognizable dances to many. Of course, this was not inconceivable choreography for intense gym fans. But to the four-year fan whose gymnastics familiarity stops at antiquated representations like Mary Lou Retton or naive ones like American Girl Doll movies, Sophina’s routine exposed the reality of gymnastics today and how relatable it can be. The connection people felt to Sophina’s routine is what caused it to go viral. People understood it, were entertained by it, thought their friends would be entertained by it, and so they shared it. Additionally, it was extremely timely choreography, and timely, entertaining content gets shared. Moreover, her performance quality is confident and skilled, something that appeals to even those who aren’t experts of the sport. Adding another element to the conversation, the video was picked up and lauded by numerous African American media outlets, several using “#BlackGirlMagic” in social media posts. These outlets were celebrating Sophina’s success and recognition, yet the coverage inevitably started the race conversation. Sophina commented, explaining that race was and is a nonissue in terms of her routine. To some, though, race was an issue when the video went viral, albeit a positive movement for athletes of color. Sadly, there was opposition. One user commented on the video saying, “These dance moves don’t belong in gymnastics. They belong in the club.” These negative comments—not only carrying racial undertones, but also unappreciative of the public recognition of gymnastics in general—are likely made by people who are unfamiliar with this type of choreography. Oftentimes, when people don’t understand something, they tend to reject it. Sophina’s routine is representative of real, current life. This realistic representation provides mainstream, approachable exposure to gymnastics, an offering unique to NCAA competition. Gymbuster: Would NCAA choreography be ill-received in elite? There’s a long-running myth that only certain styles of gymnastics and choreography will perform well on the international stage. So how would Sophina’s routine fare? Gauging whether Sophina’s routine would do well in elite is hard because you can barely compare NCAA and elite. NCAA artistry is about showmanship, while artistry in elite is much more strict. Sophina fulfills the requirements for expressiveness, personal style and confidence, as well as portraying a character. Judges appreciate various styles and just want to see the gymnast’s personal style. They judge what they see, not what they wish they could see. If the judges themselves aren’t opposed to unconventional choreography more characteristic of NCAA gymnastics, why don’t we see more of it in elite? Gymnastics fans at international meets love gymnastics. They love talented athletes performing with vigor and confidence. Thus they would likely love a routine, even one with atypical choreography, if the gymnast showed commitment when performing it. That’s why elite gymnasts should not conform; rather they should identify their personal style and perform it whole-heartedly. Even fans that don’t love a certain style love a committed performance. These are the routines that are remembered, even (or especially) on the international stage. Several gymnastics greats like Lilia Podkopayeva with her “waddling Egyptian” dance and Yvonne Tousek with her “high art/stroke” dance have received timeless attention and respect for their work. Perhaps this is a symptom of how desperate elite gymnastics fans are for off-kilter choreography. If eccentric routines have done well in the past, why don’t we see more of them from American elites? It could be that the U.S. team has the mentality of “if it’s not broken, don’t fix it.” Basically, if they win so frequently, they might not see a reason to change a thing. But this mindset represents how excellence can mask deficiencies. When all you do is win, you don’t ever take a look at what you could possibly improve. Further, the best athletes are never complacent, so why would the U.S. women stop improving now? They are a force dominating the field, but they could enhance their choreography and include unorthodox and attention-grabbing pieces of music and interpretations of that music to truly be remembered as the greatest of all time. The perception that Sophina-esque dance wouldn’t bode well for an elite gymnast or her scores on the international stage comes from U.S. coaches and team coordinators—not the judges who simply evaluate what they see regardless of whether they’re partial to it. This is an unsubstantiated perception and it should change. Taking risks is inherent to gymnastics, and Sophina’s risk of performing her choreography paid off in a big way. For now, Gym Nerds can only hope to see the Nae Nae—or something like it—in Rio.